I might just check this book out! Thanks for recommending it! Levi, I hope you enjoy it. It is a thought-provoking, refreshing and inspiring book. Great job of weaving together some of the most important and interesting facts regarding the birth of the United States of America. Coaeintmrmes like this are what make each 4th of July particularly meaningful for me. Also a reminder that no great undertaking begins perfectly, that virtually every success requires a little luck, and that any institution or process can stray from orignial intent if not closely monitored and reviewed over time. Great article. 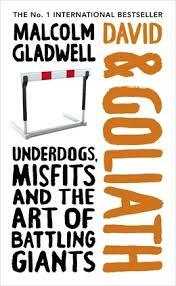 I did read this book and would recommend it along with many of Malcolm Gladwell’s books. 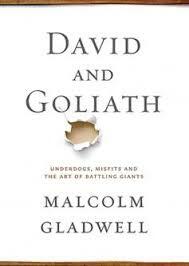 I didn’t enjoy David and Goliath as much as Outliers or Blink but I am glad I took the time to read this book. It definitely shines a different light on success and how disadvantages can be beneficial. I think it is great her wrote a book about underdogs. It did leave me feeling more optimistic about my own imperfections. I think it would be a great book for leaders because it can help them see strengths in people they might have over looked before. It is a great websites write-up and I defer for your reqrmueients what precisely you have pointed out beneath. We’ve before signed up for just a Feed during Internet explorer and are usually will be your family site reader. Thanks for made the effort in some this put in.